What does “fair trade” really mean? This gripping and beautifully produced documentary answers that question by looking at one man’s struggle to get fair compensation for coffee growers in Ethiopia. The film centers on the efforts of Tadesse Meskela, the general manager of the Oromia Coffee Farmers Co-operative Union, who travels the world to market the coffee produced by his co-op and to negotiate better prices for the African country’s product. He repeats a simple message: Africans are not fairly compensated for their crops, especially when considering the value that people all over the world place on their daily cup of coffee. The tireless Meskela also spends time educating his growers about what coffee is worth, informing them that people in the West pay $2.90 for a cup of coffee. The growers are accustomed to having a buyer come to them and inform them of the going rate for a kilo (2.2 pounds) of unroasted beans, typically $0.13. Because prices for coffee are artificially low, Africans are forced to depend on international aid. 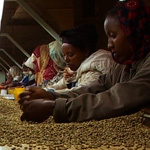 Meskela says a ten-fold increase in compensation is required to allow Ethiopians to continue to provide the world with some of its finest coffee and to afford to clothe and educate their children, which they cannot do today. The world may not be ready to pay $29.00 for a cup of coffee, but if the supply chain can be shortened, as Meskela hopes, the growers can still be compensated and consumers can still afford their morning buzz. I think sadly of the fellow shown hacking down his beautiful, mature coffee plants to clear the field for growing chat (also called qat), a narcotic leaf that local men chew to “feel better” and that brings in a higher income per acre than coffee. Nor can I shake the image of Meskela going into a London supermarket and searching for his country’s coffee, amidst the bewildering array of choices on the shelf. He finds one or two packages that contain Ethiopian coffee, but as each is branded uniquely, it’s impossible to tell just what the source is. You might presume a documentary on this topic would grow dull, but it never does: Directors Marc and Nick Francis have assembled film that tells a fascinating story that keeps you on edge throughout the film. Not only are the production values high, with gorgeous cinematography and a beautifully composed (and judiciously used) score, but the film is also well edited. It’s one of the most watchable documentaries I have ever seen. This film is a must-see for the conscientious omnivore, or anyone at all interested in how their grande latte got to their hand. It is a documentary that should become a classic in the growing field of food journalism.